Concerns about a sovereign debt crisis in Europe have re-emerged in recent weeks, highlighted by the government of Ireland’s November 21 application for tens of billions of euros in aid from the European Union (EU) and the International Monetary Fund (IMF). This action was taken to address weakness in Ireland’s banking system, which has been experiencing months of declining deposits. As a consequence, fears have weighed on peripheral European sovereign debt markets and the entire European banking system. Fears about Ireland’s financial situation intensified in recent weeks, focused mainly on a funding crisis within its banking system. Ireland’s banks have experienced weakened finances since the bursting of the real estate bubble in 2008. Recently, Bank of Ireland released a statement indicating a significant outflow of deposits in the third quarter of 2010 and a further decline in the sector’s profitability. Since the early stages of the credit crisis, Ireland’s government has guaranteed the liabilities of banks in order to restore investor and depositor confidence; the government has now applied for EU and IMF aid in order to maintain the credibility of this guarantee and recapitalize the banking system. Concerns have risen that Ireland’s debt problems might spread to other nations of Europe that, like Ireland, struggle with a large public debt and fragile financials sector. As a result, Ireland’s crisis has had a negative impact on the peripheral sovereign debt markets and the European banking sector in general. European banks are large holders of European sovereign debt; if the value of these holdings is impaired, it may result in a negative impact on capital ratios in the banking system. The European financials sector continues to be dominated by macroeconomic and secular themes, rather than by company fundamentals. We believe the dominant themes are regulatory and capital issues, as well as concerns over Europe’s macroeconomic conditions. Another evolving issue that will have an impact on the European banking system is the Basel III regulations on capital. Under the new regulations, set by the Basel Committee on Banking Supervision in September, banks will have to boost levels of capital to protect against future crises and reduce risk. 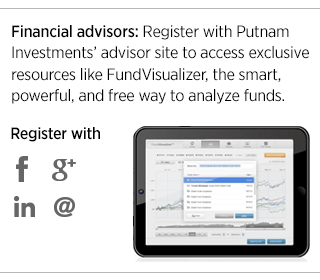 In Putnam Europe Equity Fund, we remain underweight banks within the financials sector. Also, for several months we have taken into account the vulnerability of various economies within the European Monetary Union that has the potential to cause broader ripple effects. We have preferred to invest in countries with relatively stronger fiscal positions, especially in the financials sector where funding costs are tied to the borrowing costs of governments. In evaluating banking stocks, we continue to look for greater clarification of the impact of Basel III regulations on bank capital and dividends. Above all, sovereign debt remains a key risk in the European financials sector. Aside from Ireland, sovereign debt issues have emerged in Portugal where the government is working on a debt reduction plan, though it is not seeking a bailout at this time. Spain has also come under pressure given its large fiscal deficit, weak economic conditions, problems in its regional banks, and high refinancing needs. The fund remains underweight peripheral European equity markets.